This USB-based video capture adapter can transform desktop/laptop PC or Mac computer into a full-featured digital video recorder. 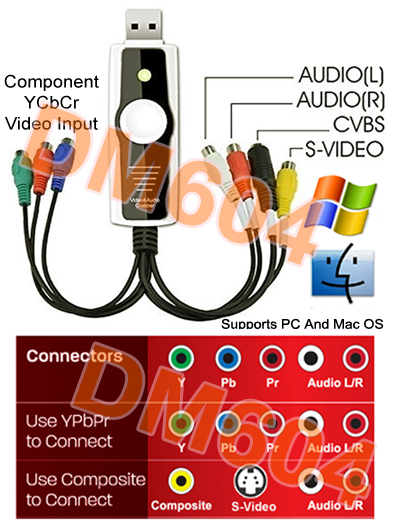 This video frame grabber package empowers PC / Mac systems with video/audio inputs so users can hook up video equipments to computer for watching or recording live video for further production such as creating high impact multimedia content for great visual aide, business presentation or streaming on the internet. 1 stereo RCA L/R audio input to be shared between video inputs. The maximum recorded video quality will be DVD MPEG2 or MP4 quality at 720 x480 pixels. This video to USB DVR adapter package supports comprehensive digital MPEG and DVD formats. It also supports still picture capturing in BMP, GIF, PNG and JPG formats via the software snapshot button. The featured Picture-On-Picture video window and the web browser can stay on the computer screen at the same time. The video window screen size and location can be adjusted as needed with ease. With this USB device installed in a computer, users can instantly expand computers with component video input. A/V signals from HD devices such as cable box, HD players or game consoles such as PS3, PS4, Xbox one, Xbox 360, Wii/Wii U can be viewed live, recorded smoothly and saved as digital files into computer in real time with no lags. [Note]: This DVR adapter does not support HD component video inputs at 720p, 1080i or 1080p. Please adjust your HD component video device to output at 480i,480p, 576i or 576p first before viewing or recording. This USB capture device can also expand your computer with composite RCA video input and S-Video input for hookup with home video equipments such as VCR/DVD player, camcorder, CCTV camera, game console such as PS2, PS3, Wii for for real time display on computer LCD monitor screen or recording on the fly. This USB DVR adapter unit allows users to hook up their favorite video game console with their computer directly for live game play or capturing their best moves into computer. Users can play and record games full screen on computer monitor. After the recording, users can also edit their recordings using any other 3rd party software tool to edit, narrate and upload their captured footage to Youtube, Facebook or mobile devices such as iPad, iPod, iPhone and smart phones for sharing or playback for review. Users can capture or record video to their Mac from a VCR, DVD player, DVR, camcorder, video camera, game console or any other analogue video device in high-resolution H.264, MPEG4 or Apple DV digital format ready for iPad, iMovie and YouTube. The recorded video feeds can be added to iTune or sync with your iPad, iPhone and Apple TV or edit it right away in iMovie or Windows Live Movie Maker and can be edited in iMovie or Windows Live Movie Maker without re-encoding. This 3-in-1 H/SD video recorder package is bundled with full-featured PC-based DVR software for recording video audio feeds and saving the recorded content into the hard drive for playback or further video production. Various video formats are available for recording session. The supported video output formats from recording includes the popular MPEG1,MPEG2, MPEG4, VCD/CD and DVD formats. Users can have the option to choose between 6-level recording/encoding speed (Fastest/Fast/Normal/Good/Very Good/Excellent) and the maximum DVD video recording resolution can be up to 720x480 pixels at 30 fps. This USB MPEG DVR device also supports Picture-In-Picture function, meaning that users can browse on the internet or work on the computer while watching DVD movie, satellite video or recorded gameplay feeds at the same time. The video screen from the selected component video, composite RCA or S-video input can always be on top of the computer screen, resulting in PIP display. Once starting up the DVR software, a PIP video sub window will pop up with the DVR software control panel on the computer screen. This PIP window can be relocated to anywhere on the computer screen and the PIP video screen size is resizable as needed and up to full screen display. This USB video frame grabber helps digitize all your VHS, Hi8/V8 tapes from VCR or camcorders into digital formats using Mac or PC system before tapes get worn out and no longer viewable. This device helps user create high impact multimedia content by adding the captured video feeds or image files to PowerPoint or other multimedia authoring application or upload your saved video feed to YouTube or other web video server for broadcasting on the internet. The bundled DVR software also supports still image capturing, allowing users to take a snapshot at any favorite video theme. The snapshot images can be taken in JPG, PNG, GIF or BMP format via the push button on this USB video grabber unit or via the snapshot button from the software. This USB 2.0 video capture device adopts the advanced analog to digital conversion so the captured video is error free with optimal color and clarity. Full-featured DVR software included for recording video audio feeds from external video devices such as VCR/DVD player, cable box, satellite receiver, Blu-ray player, game console, etc. Essential video frame grabber tool for multimedia projects such as creating high impact visual aide, business presentation, educational training or streaming on the internet. Real-time DVR adapter for transforming desktop/laptop computer into a full-function digital video recorder. Supports component YPbPr/YCbCr video input resolutions at 480i, 480p, 576i and 576p. Maximum recording quality at 720x480 pixels at 30fps through using computer. Advanced 10-bit A/D converter built in for digitizing analog video into quality digital formats for storage/collection. The recorded video content can be stored into the hard drive for playback or further video production. Supports video recording in MPEG1, MPEG2, MPEG4, VCD/CD and DVD format for PC system. Supports video recording in H.264, MPEG4 or Apple DV digital format for Mac system. Supports video playback in full screen or PIP picture-in-picture style on the computer screen for PC. Movable and resizable PIP video window screen for PC use. Supports snapshot function to take still picture of video theme in BMP, GIF, PNG and JPG formats. Supports both 16:9 and 4:3 ratio for video window size. Support color controls of Brightness, Contrast, Hue, Saturation. Supports all NTSC, PAL and SECAM video formats for worldwide compatibility. Supports Windows OS including Win10, Win 8/8.1, Win7, Vista, Win XP. Supports Mac OS from 9.X and all later Mac OS X 10.X versions. Component Video Input Resolution Support: 480i, 480p, 576i, 576p. Window OS Support: Win10, Win 8/8.1, Win7, Vista, Win XP. Mac Support: Mac OS 9.X and all Mac OS X 10.X versions.